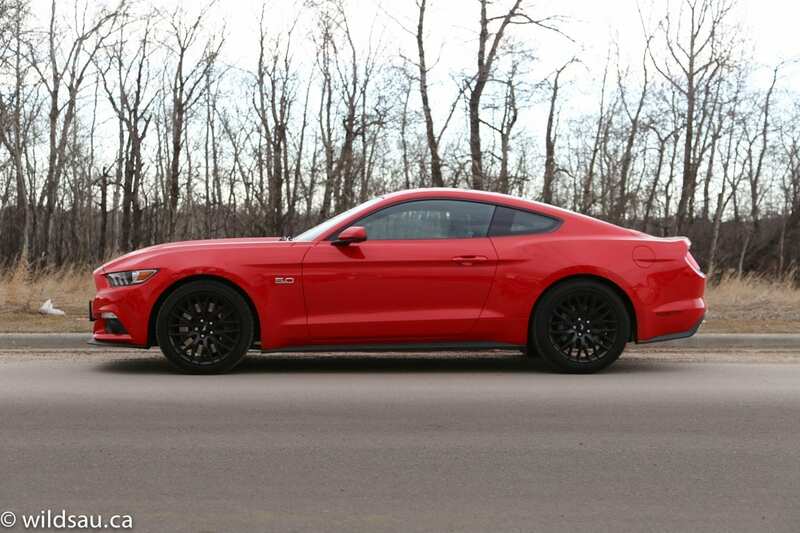 A modern muscle car that does almost everything right. 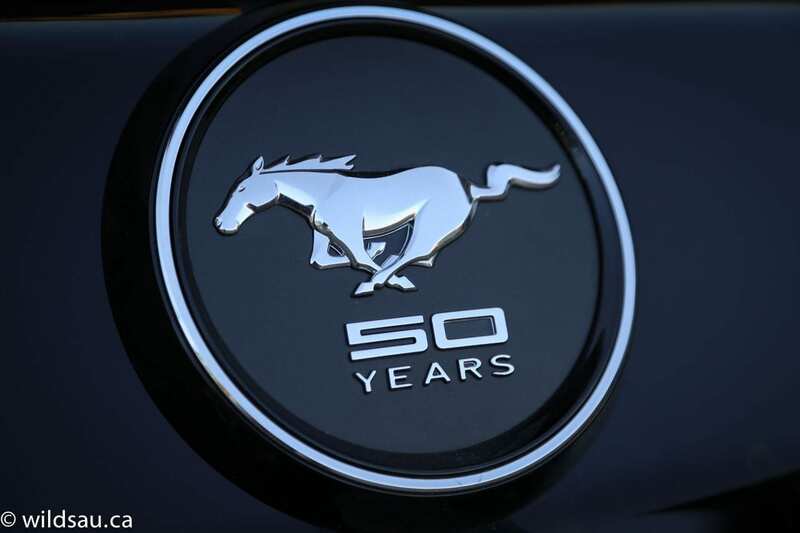 The new Mustang’s styling honours the ageless fastback design of generations past, and is immediately identifiable as a Mustang thanks to some of the vintage-inspired details. Yet Ford has managed to take a bunch of retro features and combine them into a thoroughly modern interpretation of this venerable classic. It’s a beauty. 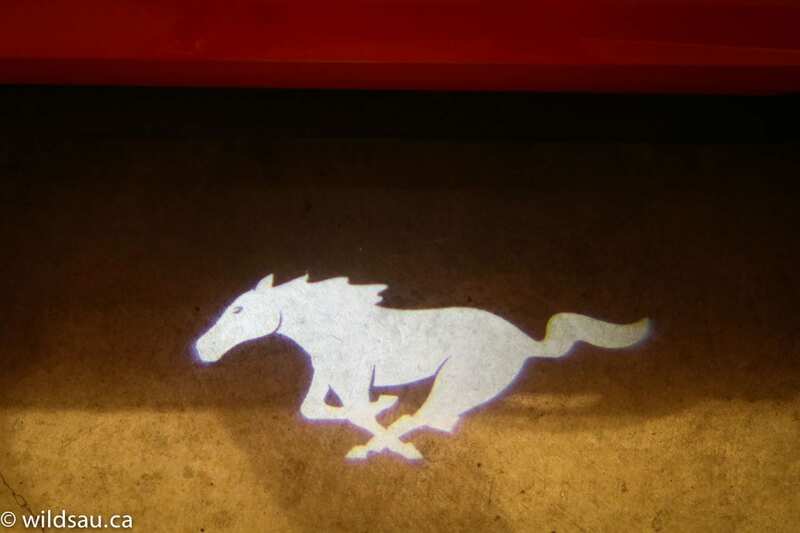 And it was very appreciated by owners of older Mustangs, as well as nearly anyone who had a look at it. 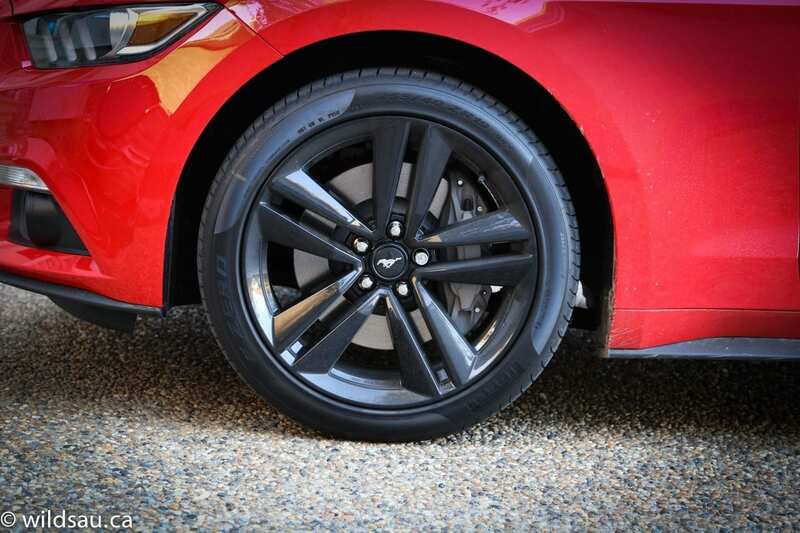 This car gets a ton of looks, especially in my review car’s eyeball-searing Race Red and its contrasting and visually striking black painted aluminum 19-inch wheels with monster 255/40s on the front and 275/40s in the back. 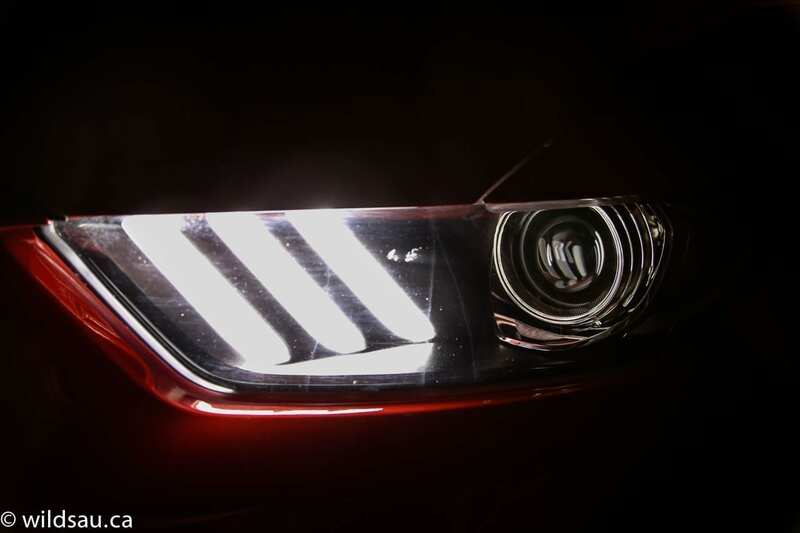 The new car is now wider and lower, and its aggressive snout looks fantastic with the gaping grille, the HID headlamps and signature lighting. 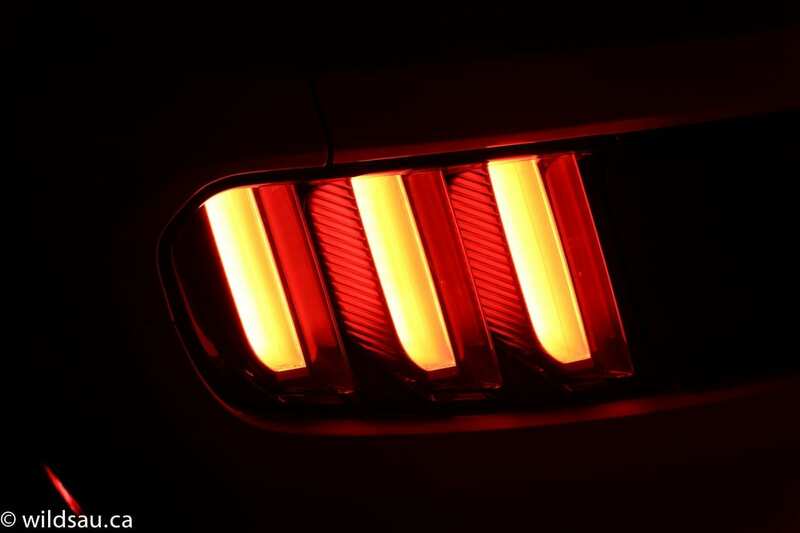 And yes, the famous tri-bar LED tail lamps (with sequential turn signals, love ’em or hate ’em) are standard on all models. If there was an angle that didn’t strike a chord with everyone, it was the rear end – not everyone loved it. I like it a lot – especially with the Performance-Package-specified rear spoiler deletion. 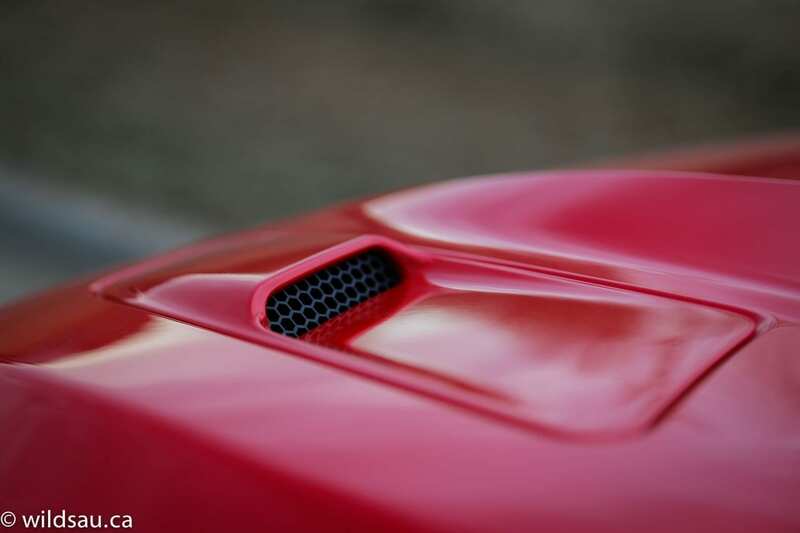 If I could make a request, I’d love slightly meatier exhaust tips – either quad exhausts or bigger ovals, something to say this machine means business. 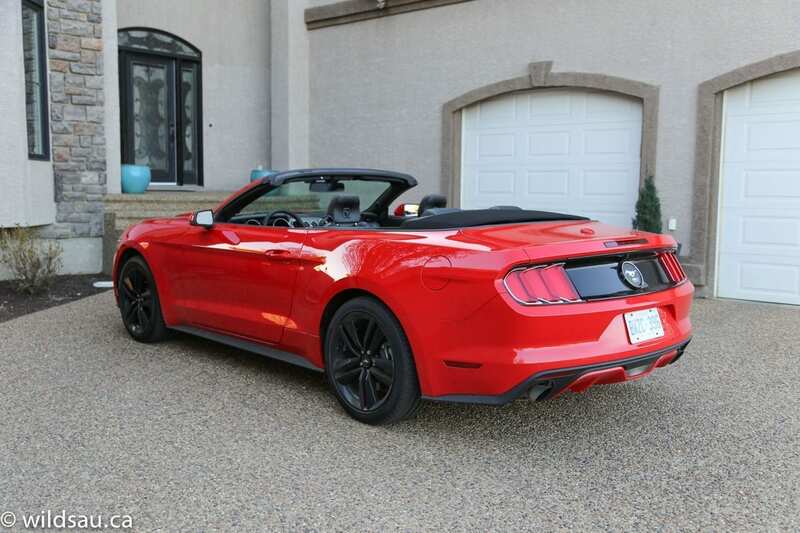 I think they’re a bit too puny for a 5.0-litre V8 muscle car. 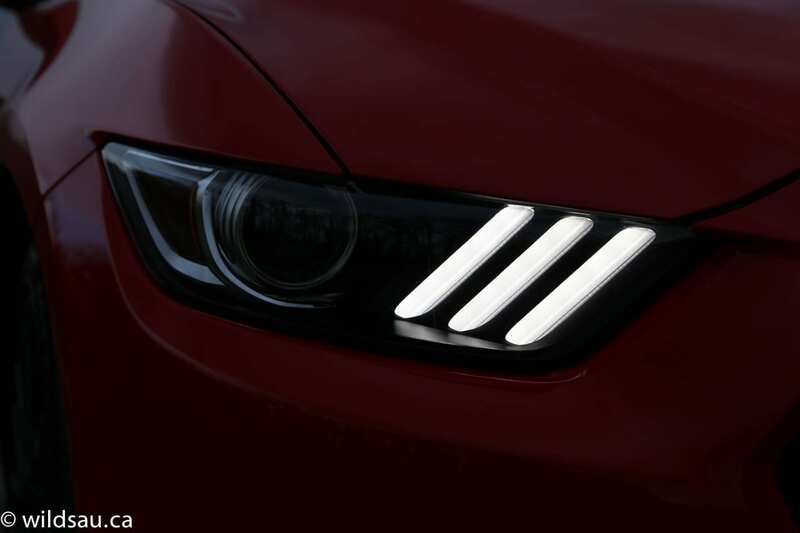 Ford isn’t kidding with their 5.0 badge. It’s a true 5-litre V8 lurking under the massive hood. It peeks out from under a nifty looking brace and looks like it means business long before you fire it up. This one sends 435 horsepower and 400 lb.ft of torque to the rear wheels via a 6-speed manual transmission. If you’ve read this far and are sitting on the edge of your seat, wondering what the fuel economy is like, please close this window and type “Life confuses me” into your search engine. 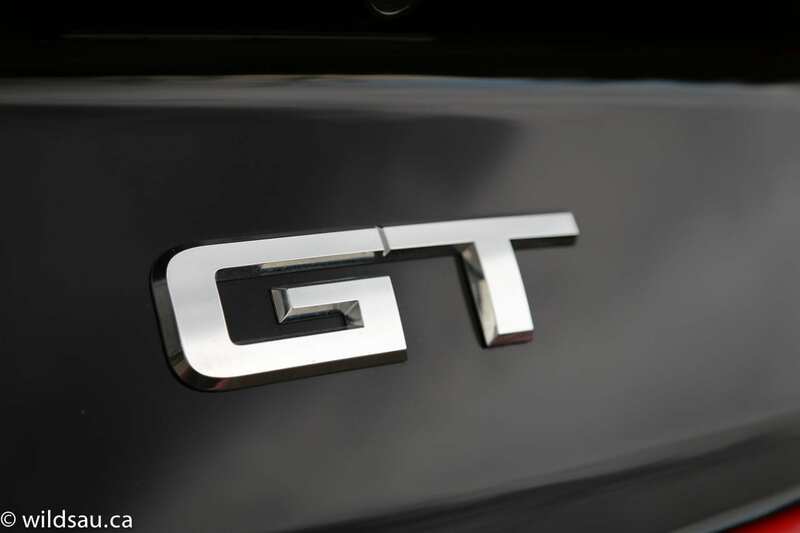 You don’t consider a 5.0 GT Mustang when fuel economy matters. That said, I averaged 15 L/100 km (16 US mpg) during my week with it, and I never drove it with a light foot. Considering what this machine is capable of, I was quite happy with that mileage. 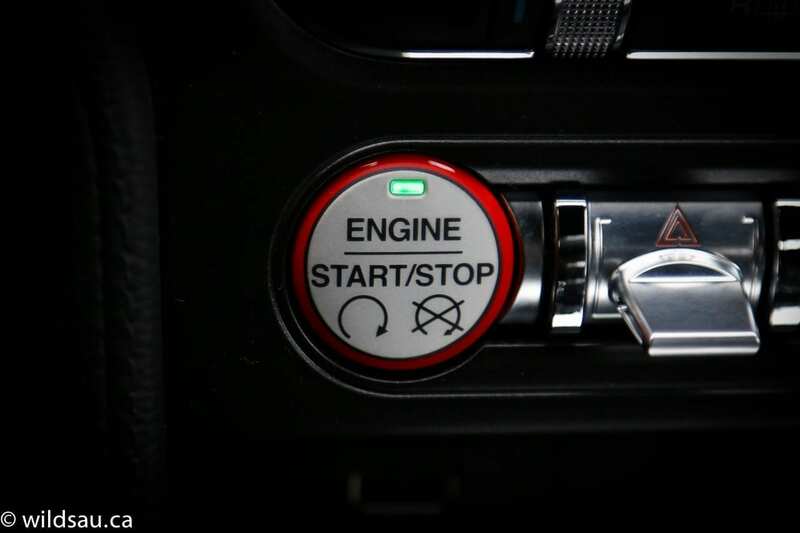 Once you’re in, you can’t wait to depress the push-start ignition which instantly turns over the big engine and in a split second, you hear the initial explosion of V8 flatulence which quickly settles to a fantastic rumble that somehow finds the perfect balance somewhere between refined and hooligan. 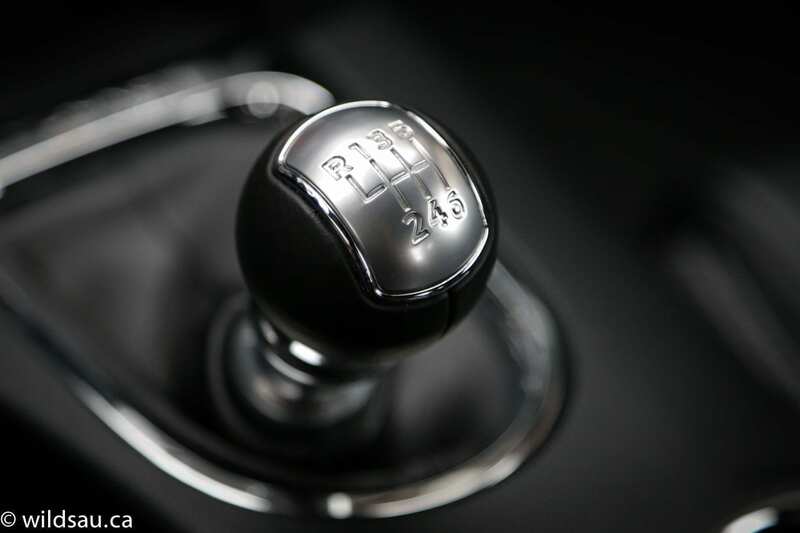 Palming the relatively short throw shifter, you’ll feel its clunky pattern – but in a good mechanical sort of way. 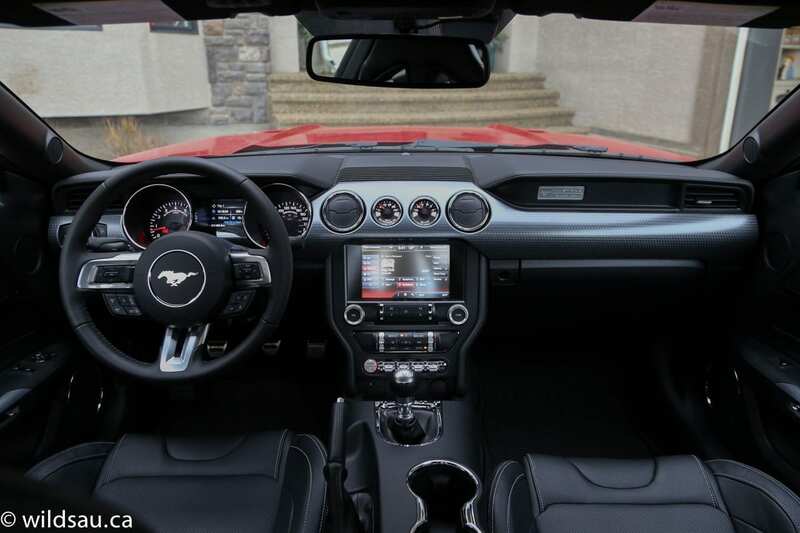 The clutch is heavy, but with a friendly, easy take-up – the Mustang is easy to drive, even commuting in stop-and-go traffic. Find the first patch of open road, and dip into the gas – the power is immediate, explosive even, and the torque is on tap at any time, with absolutely no hesitation. 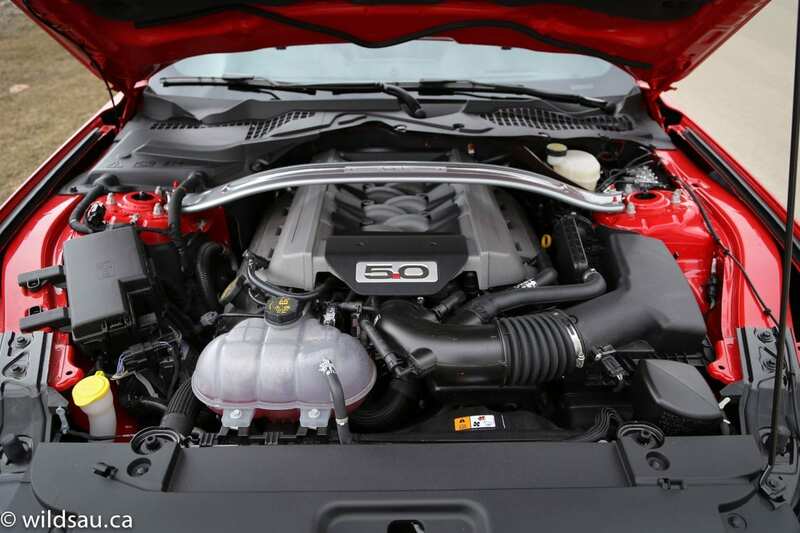 There’s something about a powerful normally-aspirated V8 that, even though on paper it might give up low-end torque to a well-tuned turbo engine, seems invincible. There’s nothing like it. 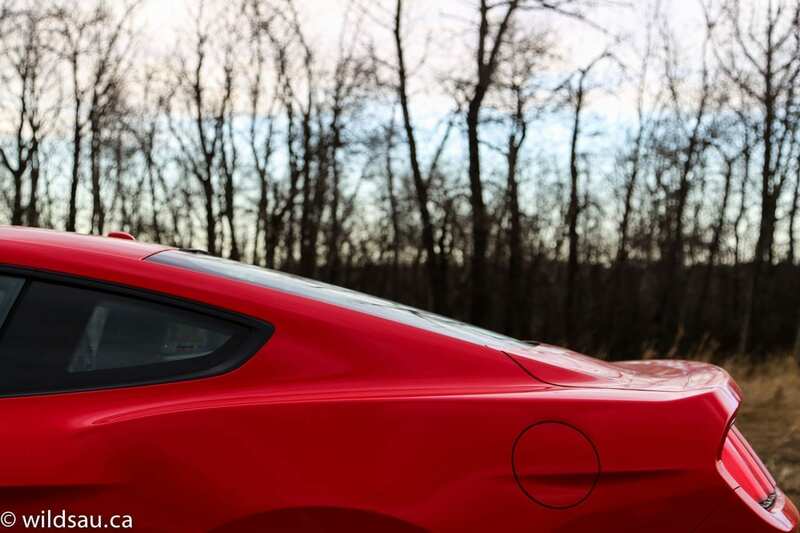 And when you get on the gas, whether it’s a little or a lot, the 5.0 expels vicious, visceral sounds that brought a smile to my face immediately – every time. 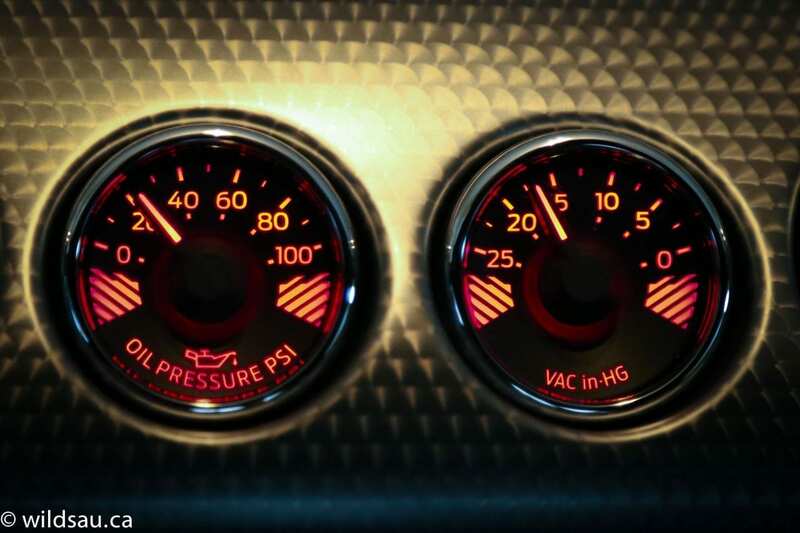 Just be careful – the engine is always audible and it grabs the attention of anyone around you. 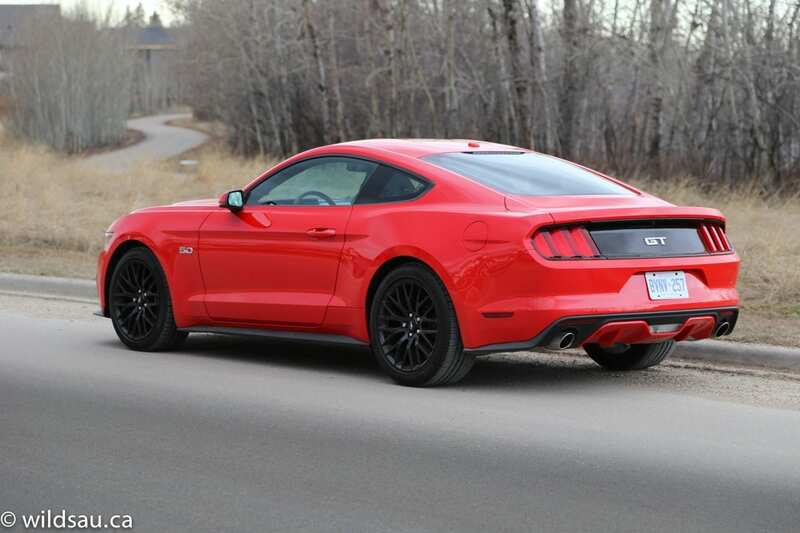 The 5.0 is definitely a noisy beast and I love it – it is the stuff of Mustang legend! 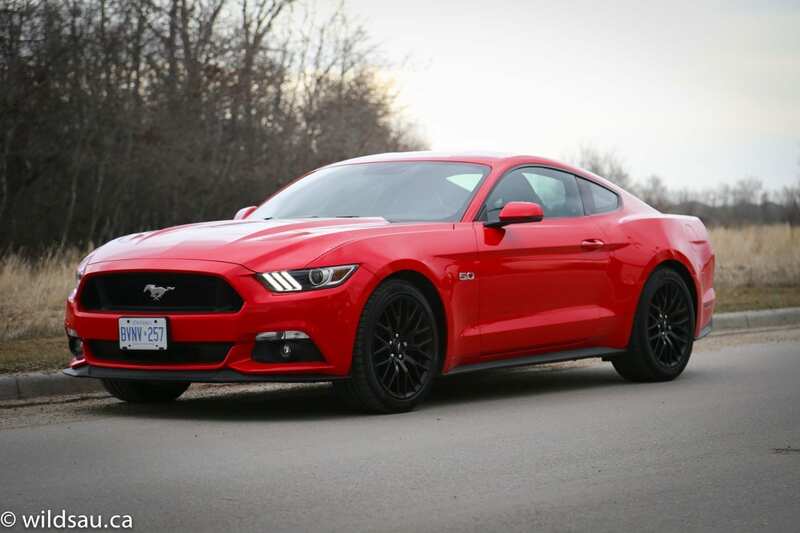 If that bothers you, you might not be a V8 person and the EcoBoost Mustang (also a fine offering) might be more to your liking. 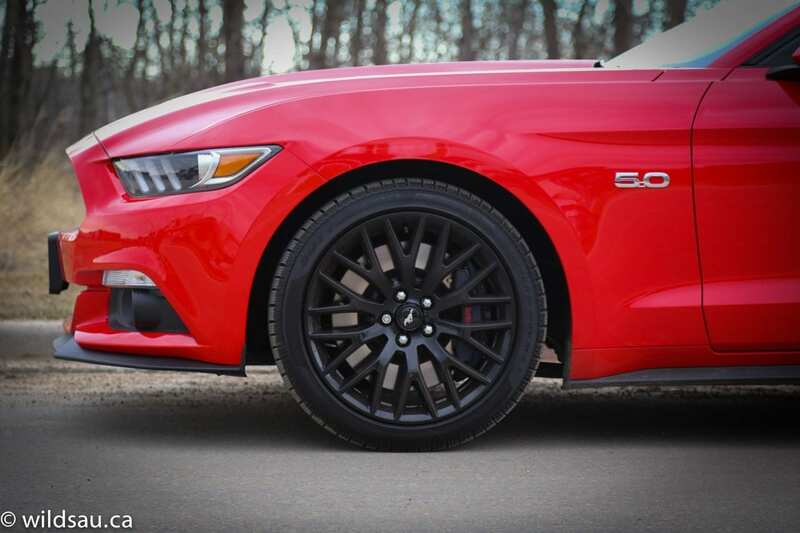 The 5.0 would love to chew through rubber all day long. It’s made for it. And it’s so much fun. Adding to the tire-shredding capability are two features that are nothing but evil temptations. The first is the electronic line-lock. 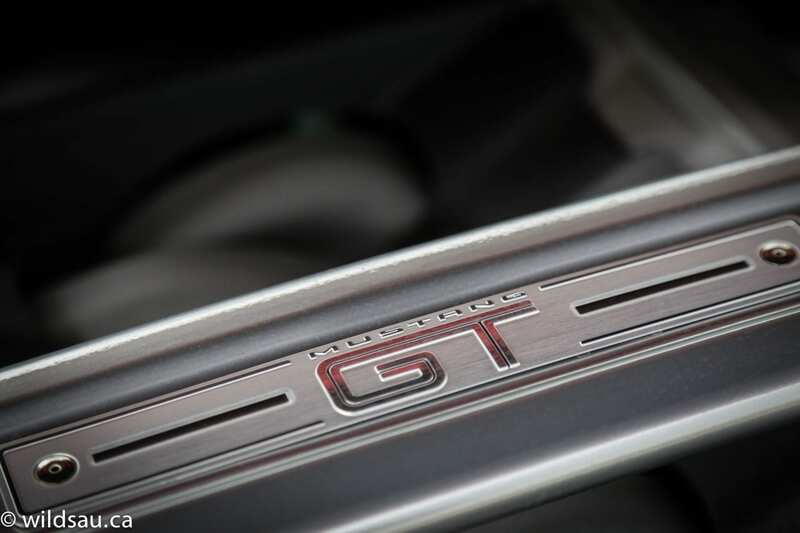 Yes, a line-lock is standard on the GT. Yes, it does what you think it does. 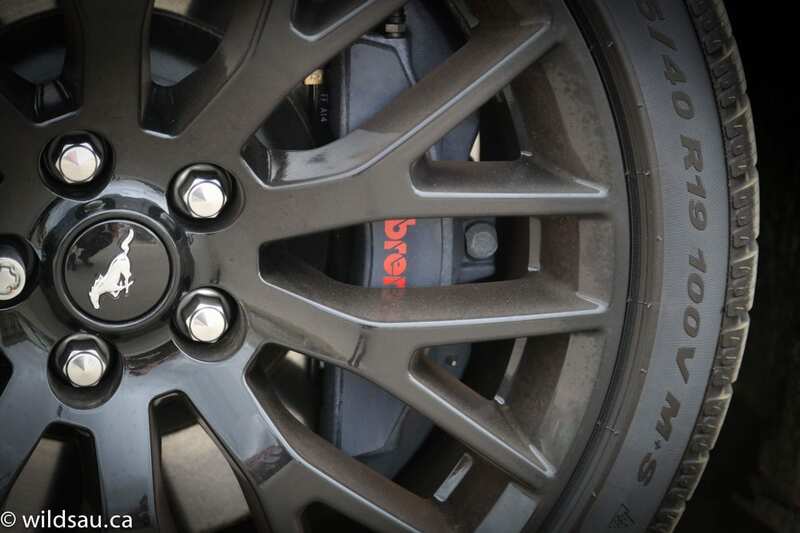 It locks the front brakes and leaves the rears alone, allowing a driver to “warm up the rear tires to enhance grip” at the track. Ha! It also allows for epic burn-outs. I’ll leave it at that. And if you want to move on from burn-outs and see what this monster can do in a straight line, it also has launch control, which uses the brakes, traction control and drivetrain controls in concert to reproduce consistent, incredibly devastating launches. Like you-will-become-part-of-your-seat launches. 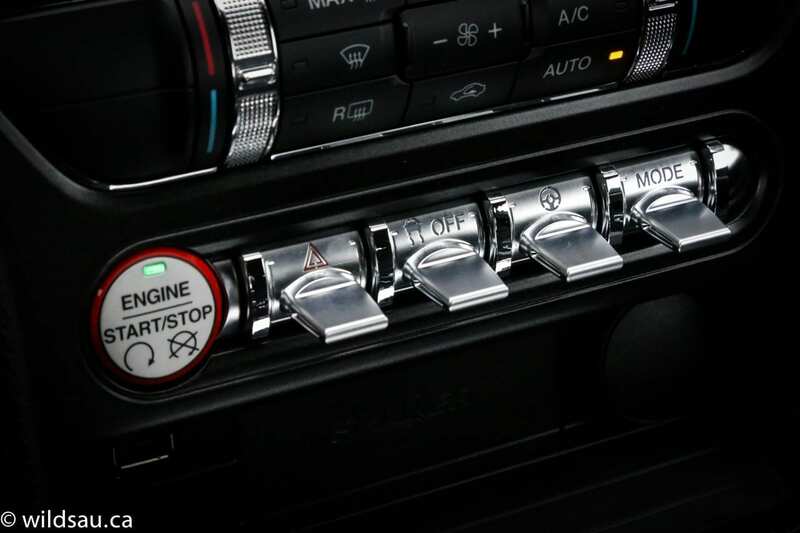 Ford allows you to tailor your driving experience somewhat, using the metallicized plastic toggle switches at the bottom of the centre stack – steering feel, drive mode (normal, Sport plus, track, snow/wet) – the car adjusts the handling characteristics and responsiveness based on your choice. 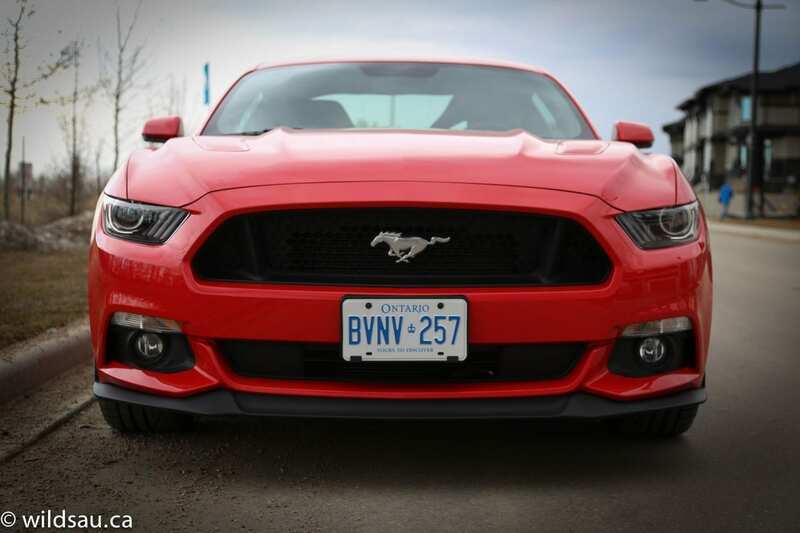 For the first time, I can say without any reservations or caveats – the Mustang’s handling is absolutely incredible. Ford has dialed in the steering to “just right”. Yes, at slower speeds, it seems like a big, heavy (it is heavy – 3706 pounds!) muscle car of old, lumbering around town, but the faster you drive, the better this car gets, and it will surprise most people with its unflappable capabilities. Push it hard and the Mustang seems to get smaller, and when you start throwing it into corners, you’ll find it rotates on that proverbial dime. The independent rear suspension goes a long way. Make no mistake, this straight-line muscle car is a track star, and it will outhandle a large portion of the sports cars out there, including some that have an established handling chops reputation. 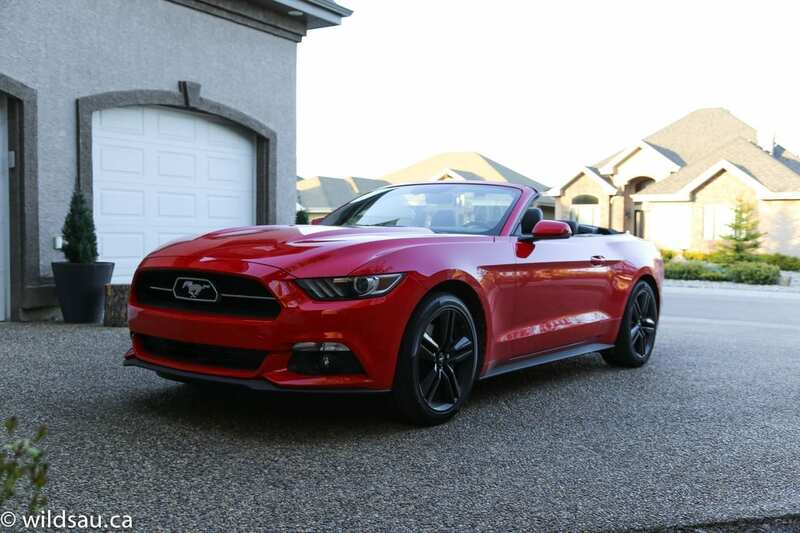 The ride is what you’d to expect from a Mustang – hard, and bordering on harsh when it comes to bad roads. The brakes? Yeah, they’re Brembos and they have the ability to send you flying through the windshield if you’re not buckled up. They haul this Mustang down from way-too-fast to not-moving-at-all quicker than you can say “I believe I just soiled myself”. Visibility out of the car is outstanding except when it comes to parking – that long high hood that suddenly drops off makes it tough to tell exactly where the front end is. 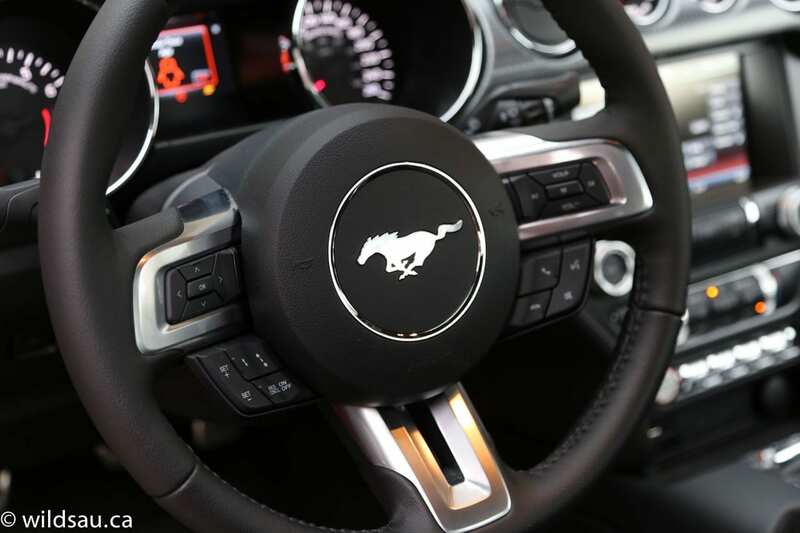 As great as the Mustang is when you push it, it should be noted that it’s easy to drive around town and it’s a relaxed commuter, albeit with a stiff-riding suspension. 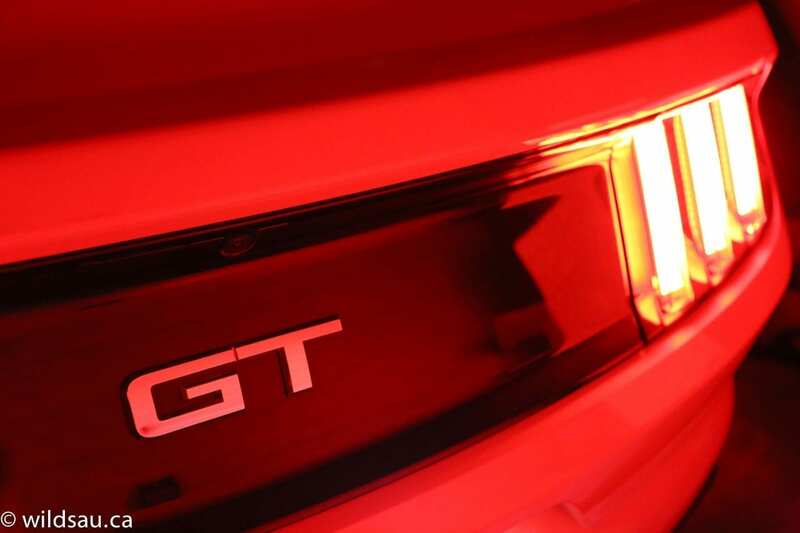 The new Mustang should not be taken lightly in any aspect when it comes to its performance. 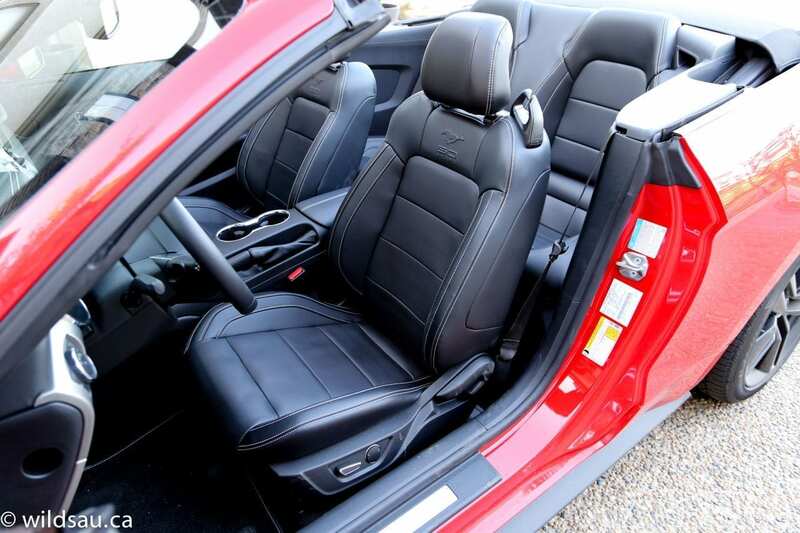 OK, OK, I’ll discuss the interior, but ever so briefly – well, briefly for me. The cabin felt just right for me – I’m 5’10” and had enough head room and everything is within reach and cozy. The Mustang’s materials are OK. The stitched paneling on the doors got my hopes up but then I saw the plastic panels on the dash and centre stack with fake stitching on them and that put me off. Add in the centre console and glove compartment, both of which are clad with 100% hard plastic and it does feel a bit cheap and behind the curve when it comes to interior quality. With that said, the fit and finish appears to be quite good and the vehicle felt very solid. There are some cool things to be found here. 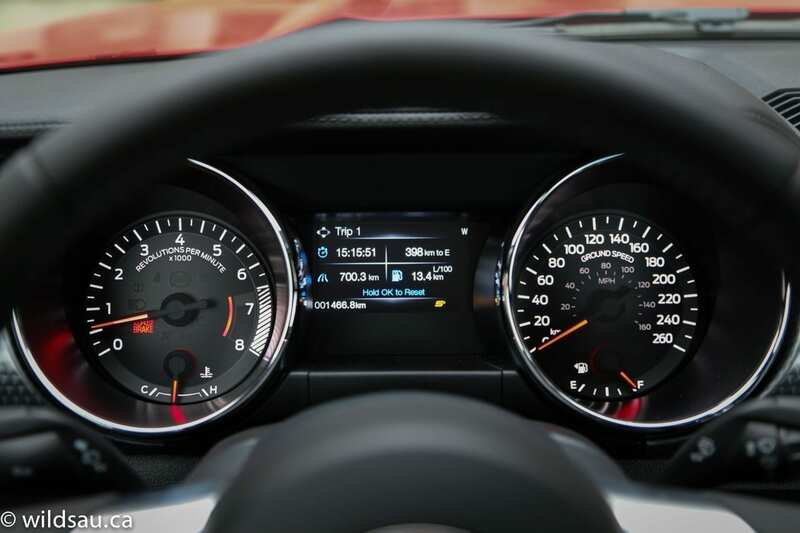 Nice clear gauges, including the “ground speed”-labelled speedometer. A grippy and comfortable steering wheel. 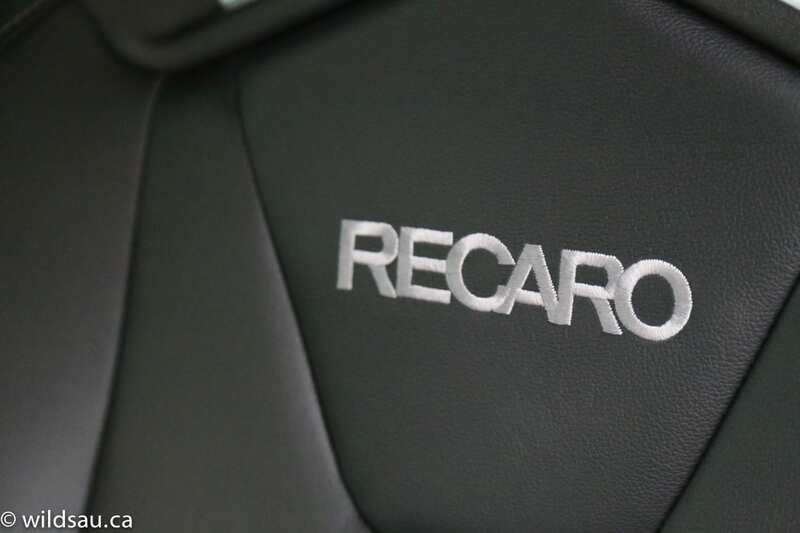 And the Recaro seats – they’re not heated or power-adjustable but pretty awesome in every other way that actually matters – ultra-supportive, perfectly bolstered, comfortable and ready to accommodate a harness for track use. My car had the ubiquitous MyFordTouch system, which I don’t mind at all. The 12-speaker Shaker sound system sounds pretty good and there’s a dual-zone climate control system. You get a bit of assistance tech too – blind-spot monitoring and a much-needed backup camera with park assist. 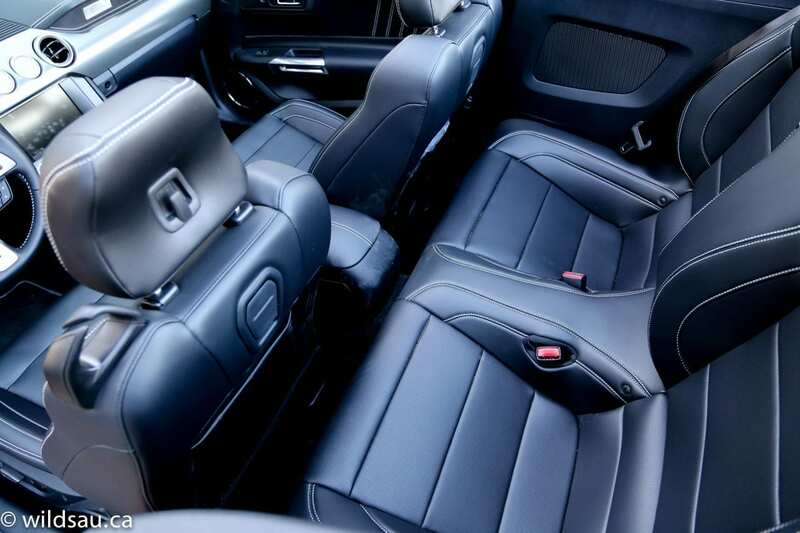 The back gets two deep bucket seats. All facets of being a rear passenger are brutal – getting in, sitting back there and then getting out. There’s no head room. And the leg room is negligible, even for kids – whichever two kids got to come with me for a ride were very unhappy back there. There are two sets of LATCH anchors for anyone who wants to go through the trouble of trying to put kids back there. Good luck. 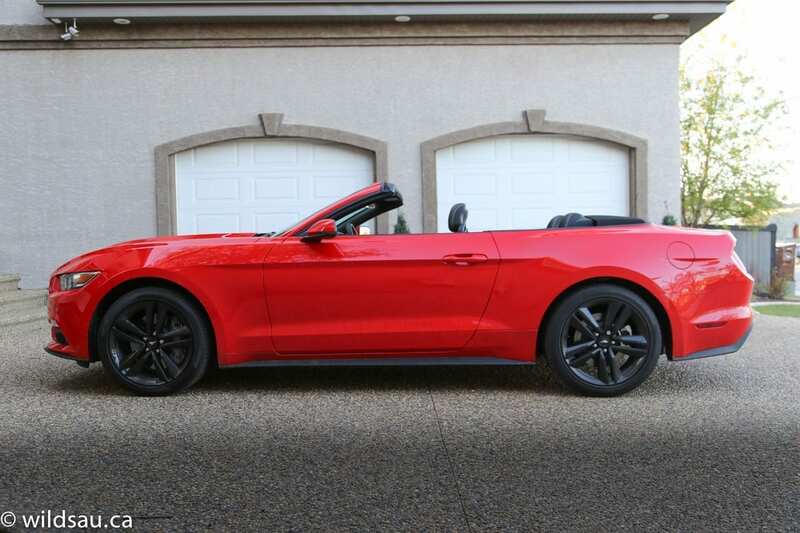 What Ford has built here is a true muscle car, but one that is modernized enough to be surprisingly great at almost everything. It’s fun to drive and there’s much to love. The interior still needs work, but it’s certainly come a long way. The rest of the car – well, it’s darn near perfect. WAF (Wife Acceptance Factor) was, um, not so great. First of all, she doesn’t drive manuals, so she was only a passenger. She winced when it fired up, she grimaced when I stepped on it, she held on tight when I threw it into a corner, and she held her sides when we drove over a section of washboard road. In other words, it’s a great sports car. Well done, Ford. Well done. 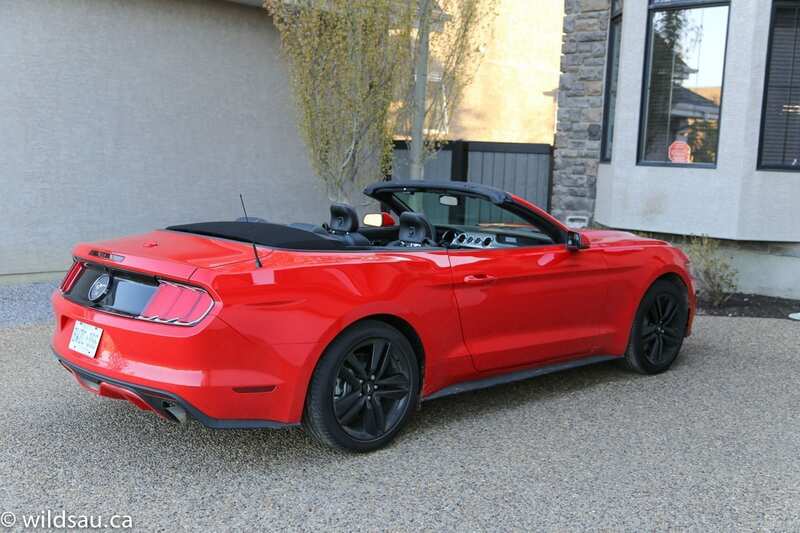 I also drove the EcoBoost convertible Mustang, which is a whole different kettle of fish. 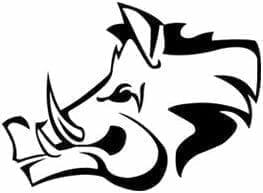 Pictures are included below. While it’s the same car underneath, the differences are huge. First of all, let’s look at the interior. It has base seats. 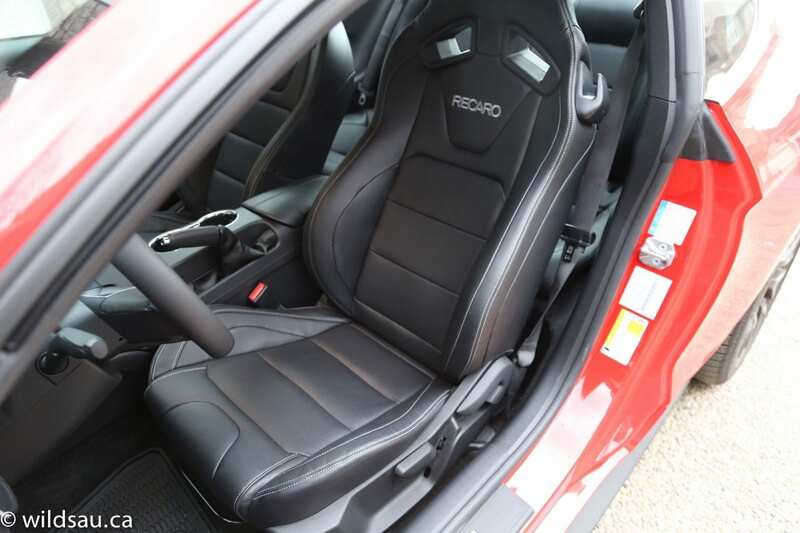 While they’re not nearly as aggressive as the Recaros, they’re actually more comfortable, significantly more adjustable and still very well bolstered. Otherwise the car looks much the same inside. 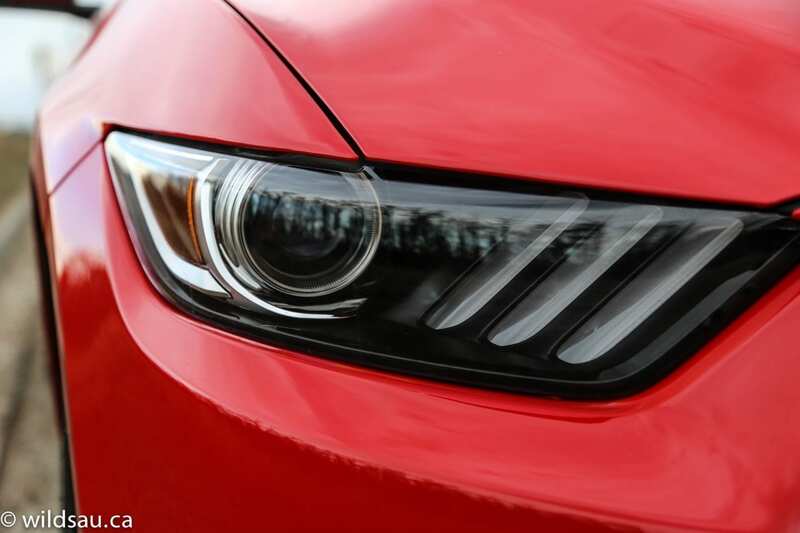 From the outside, Ford has done a wonderful job of keeping the two versions similar and you’ll need to look for cues that aren’t immediately obvious to tell them apart. 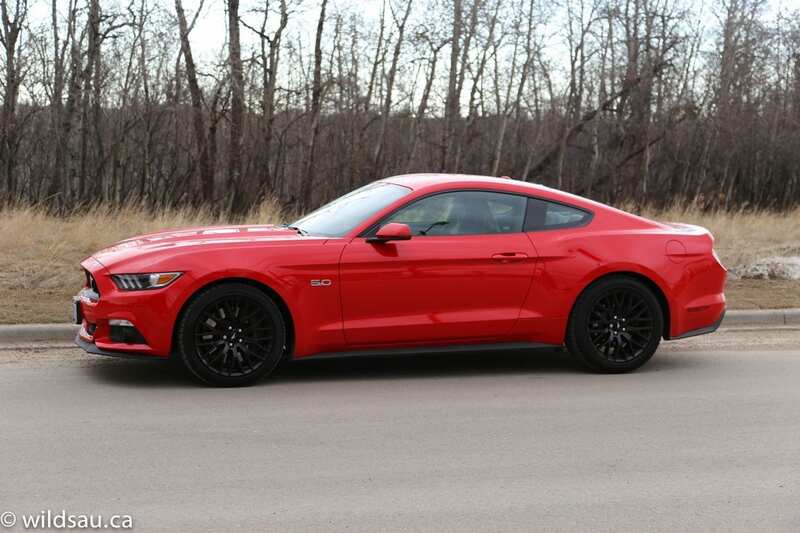 In other words, this doesn’t look like the cheap cousin of the 5.0 GT. 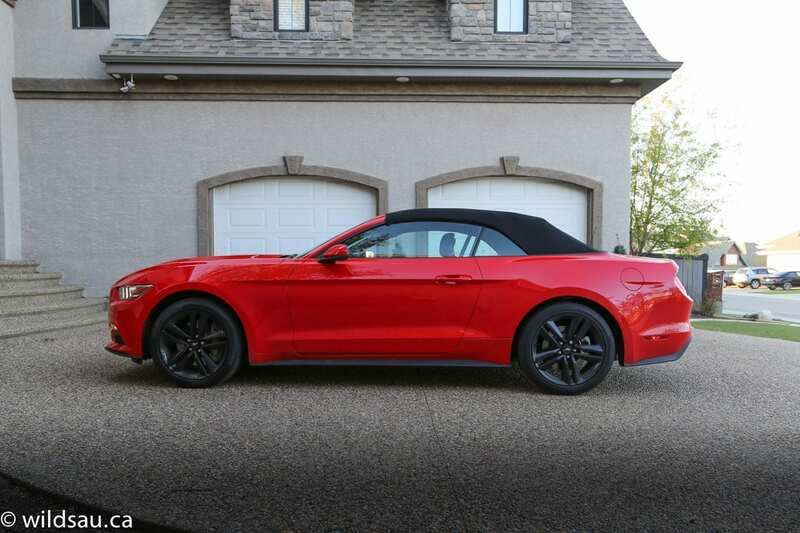 In terms of the driving experience, the whole vehicle doesn’t feel measurably lighter because, even though the 4-cylinder engine is lighter, the convertible top adds weight. 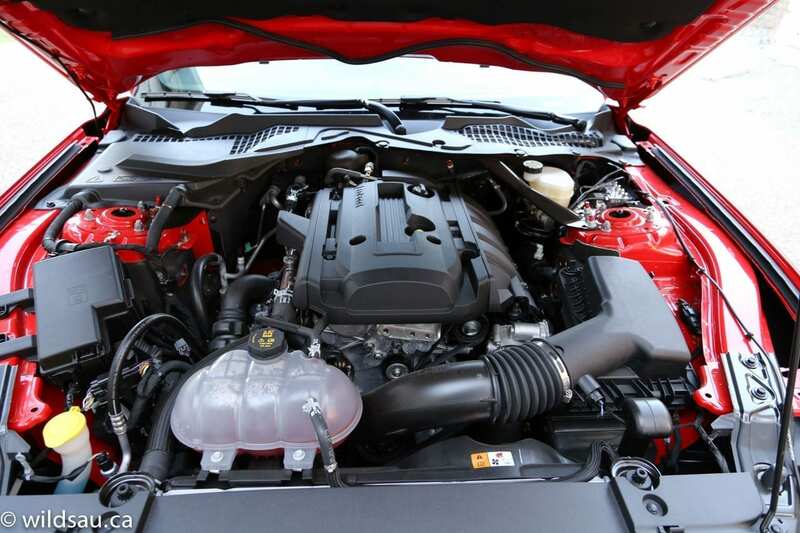 Speaking of the engine, it’s a pretty sweet one – a longitudinally-mounted 2.3-litre turbocharged 4-cylinder that cranks out 310 HP and 320 lb.ft of torque. 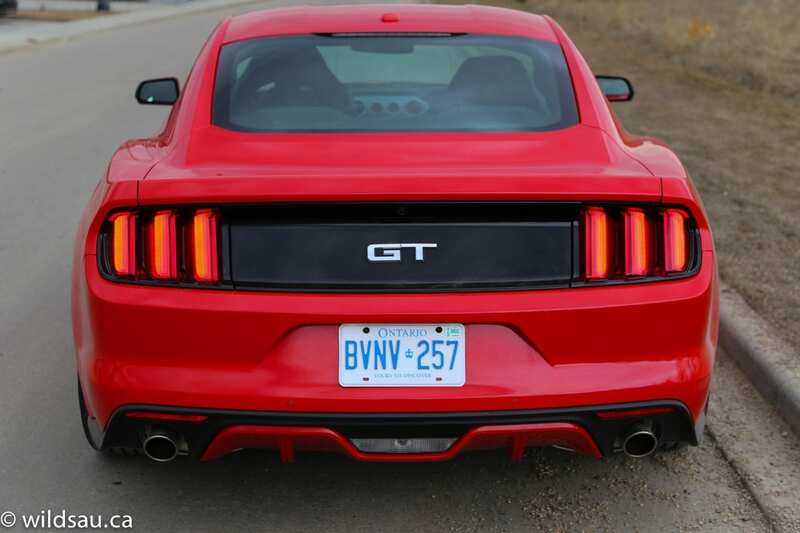 It wasn’t long ago that we saw those numbers coming out of the Mustang’s big V8. 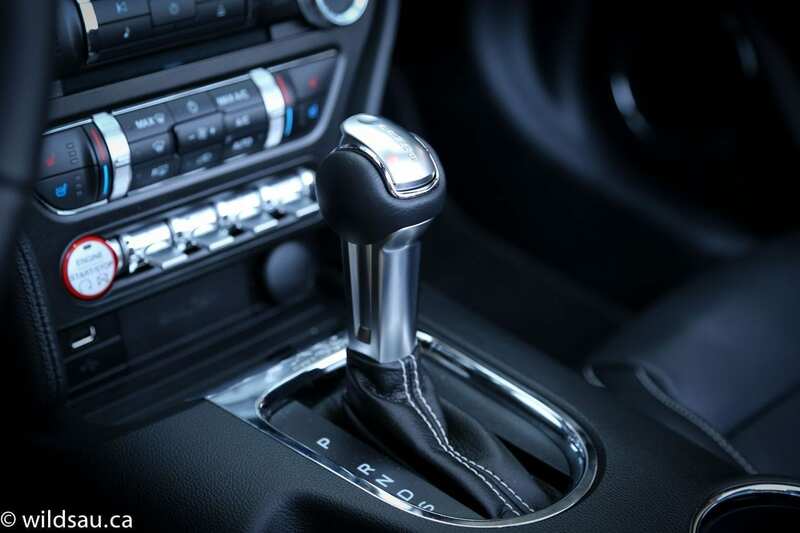 While the numbers are impressive, the 6-speed automatic does make things more docile. You do get the Sport and Sport + modes and they are quite transformative, making a noticeable difference. While the responsiveness and handling are all turned up a few notches under the influence of these drive modes, it’s still not as engaging as the V8. It’s just a different experience, but should not be underestimated in any way – it’s a tremendous sports car in its own right. And it’s not a weakling – I drove it in the wet, and it happily breaks the rear tires loose with a stab of the throttle any time. But the biggest thing missing is the sound. 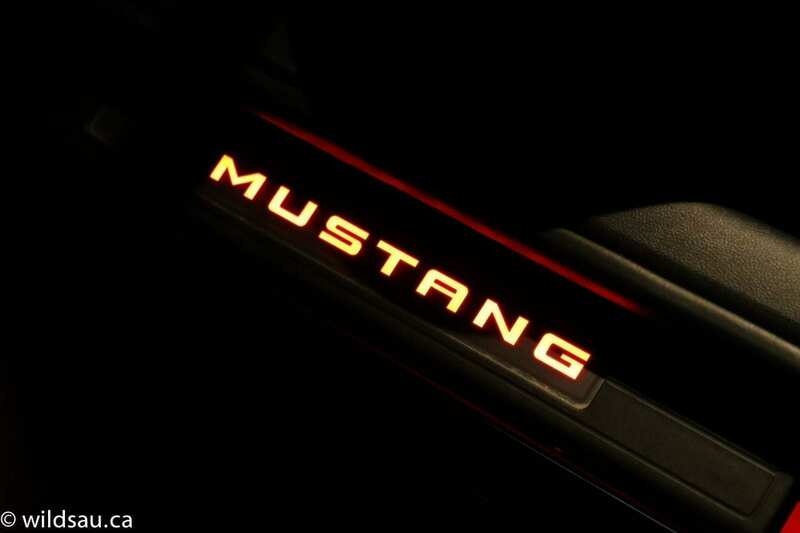 Somehow, a Mustang seems to come alive with a V8, even if you’re driving around town slowly. They just go together. 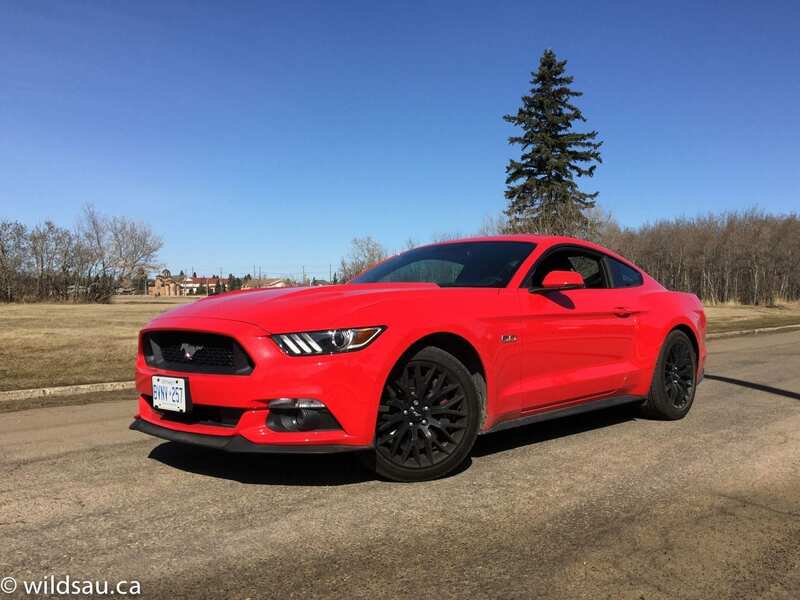 The EcoBoost often has virtually no sound at all and when you do hear it, it’s a honky, warbling note that isn’t inspiring and most importantly, it’s not the V8 sound that is so amazing. So while the EcoBoost is a great engine and makes for a great driving experience, the car feels like a lesser car due to the sounds (or lack of them) it makes. Fuel economy is better obviously – I averaged 12.2 L/100 km while driving with a heavy foot, so that’s a marked improvement over the V8 if that matters to you. The convertible top is very well done. It opens very quickly – I timed it at about 12 seconds for the windows and top to drop. 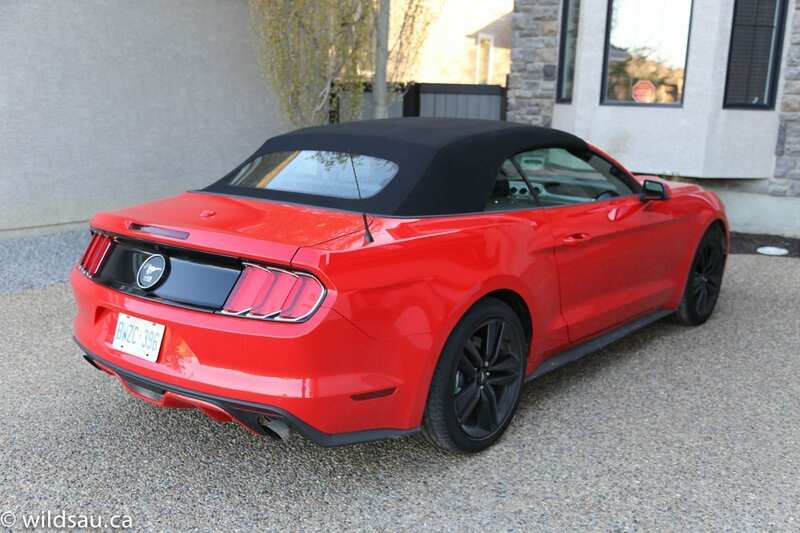 It is quiet too – not like the hardtop obviously, but I found it well insulated – occasionally I found the top let in more ambient noise than from the Mustang itself, as I would clearly hear the vehicle next to me if it was a loud one. Unfortunately, it’s nearly impossible to drive around with just your windows down as the buffeting from the wind is brutal and causes the rear window to flutter non-stop, making it impossible to see out the back. Mind you, the noise and vibration will get to you long before the reduced visibility will. Best to keep the windows up or put the whole top down. 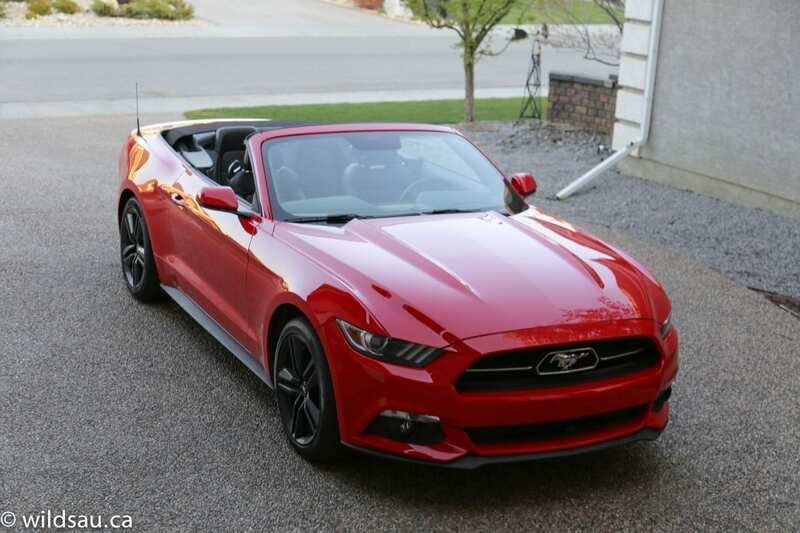 The following pictures are of the EcoBoost convertible.